This new office and research complex is the centerpiece of the largest planned research park in the national capital region. Forecasters across the U.S. rely on the National Oceanic and Atmospheric Administration ﻿and the National Weather Service to provide the fastest and most accurate information. ﻿Nearly all meteorological data collected globally arrives here for analysis by NOAA’s environmental scientists. To support the organization’s mission of understanding and predicting changes in the earth’s environment, the design reduces the Center’s impact on the environment and physically embodies man’s relationship to nature. Just as natural systems do not operate in straight lines, the building is configured in a series of curving wings that intersect in a central atrium. The building form is organic, with “waves” of space. The north elevation features continuous horizontal bands of windows that allow sweeping views into the woodland preserve. The south elevation consists of a curtain wall with sunscreens that reduce solar heat gain and act as light shelves that bounce daylight deep into interior spaces. Visible from the interior, the lower roof surfaces are vegetative planes. These surfaces surround the sweeping, inclined central roof that rises from the building entry to an apex at the cupola. Here, within the facility’s highest occupied space, researchers collect atmospheric data. Designed as a central gathering space, the five-story atrium encourages the informal interaction between scientists and administrators that is crucial to the development of science. With the main stairs and amenities clustered around it, this atrium becomes the building’s social and emotional center. Sustainable design strategies include water-sensitive site design, bioretention, energy performance optimization, natural daylighting, enhanced indoor air quality and increased thermal comfort and control. A large, extensive green roof covers a majority of the roof surface, functioning as the building’s “fifth elevation.” Excess stormwater runoff from the roof moves down a waterfall by an outdoor dining terrace to a rain garden, where it collects and filters through wetland plantings. An underground cistern collects on-grade stormwater runoff to reuse for site irrigation. The site’s planting palette features native and adapted species that can withstand challenging heat and drought conditions with little irrigation. The variety of native grasses, perennials, ferns and shrubs weave together in broad drifts beneath scattered trees, creating the feeling that the building has risen out of a natural landscape. 268,000 sq. ft. / 24,900 sq. m.
HOK CEO, President and D.C. Design Principal Bill Hellmuth shares his vision for the future. 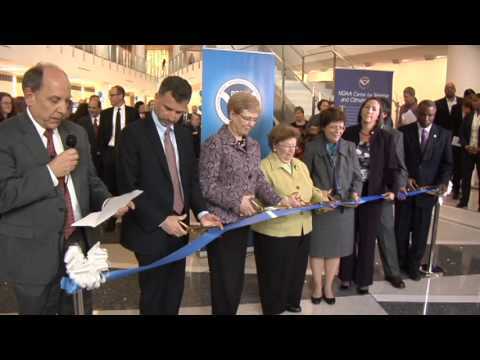 Watch the ribbon-cutting cermemony for NOAA ‘s new Center for Weather and Climate Prediction at the Univesity of Maryland in College Park. View construction images from the NCWCP site.